- All photos on this page by Jim Mason Lakewood Park in Salina provides an opportunity to explore an urban nature area. Hiking trails weave through an area containing prairie, woodlands, and water. The entire site is developed around an old sandpit, which is now dedicated to nature interpretation and recreation, Many species of wildlife typical of urban woodlands are found here, including white-tailed deer, fox squirrels, and raccoons. 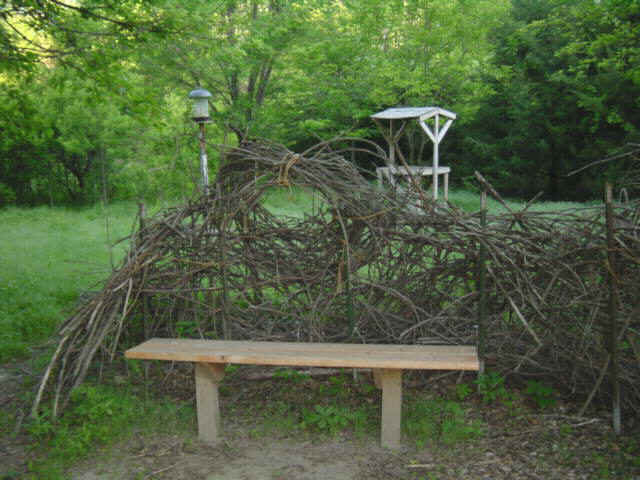 This unique bird viewing blind is located in the woodland area behind the Discovery Center. Several nest boxes and houses have been erected to attract bats, screech-owls, purple martins, eastern bluebirds, and wrens. Visitors to the Headquarters Lodge can enjoy the activity around the bird feeders, check out the various interior displays or search for insects in the butterfly garden. Plant enthusiasts can find over 35 species, and a small native prairie blooms with butterfly milkweed, purple prairie clover, leadplant, and coneflower. A short distance south of Lakewood Park is Indian Rock Park. Perched on the bank of the Smoky Hill River, this site has a unique blend of human and natural history. Park at the south end of the large hill and get a trail brochure at the interpretive kiosk. The brochure has a list of the wildflowers in the park on the back page with over 100 species on it! The best wildlife habitat is on the top and west sides of the hill. The steep hillside just north of the kiosk has a good diversity of wildflowers including blue wild indigo, puccoon and yucca. Just north of there, look for northern orioles, ducks and kingfishers around the small pond. Be sure to hike up to the top of the hill, and take the trail loop to the river overlook for a view of the Smoky Hill river gorge created in the 1950's by the Corps of Engineers. Black locust is a common tree species here, and its fragrant clusters of white blossoms make a May visit even more pleasant. 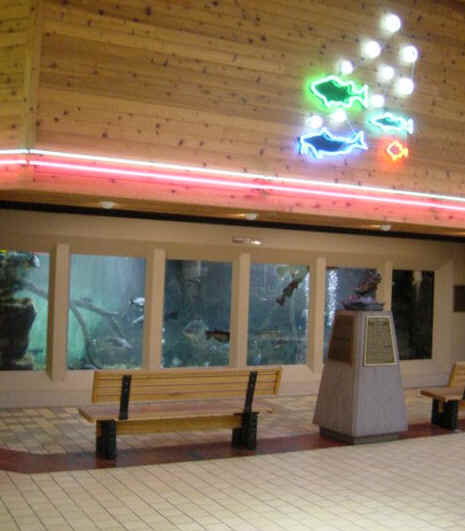 While in Salina, visit the Kansas Fishes Exhibit in Central Mall. 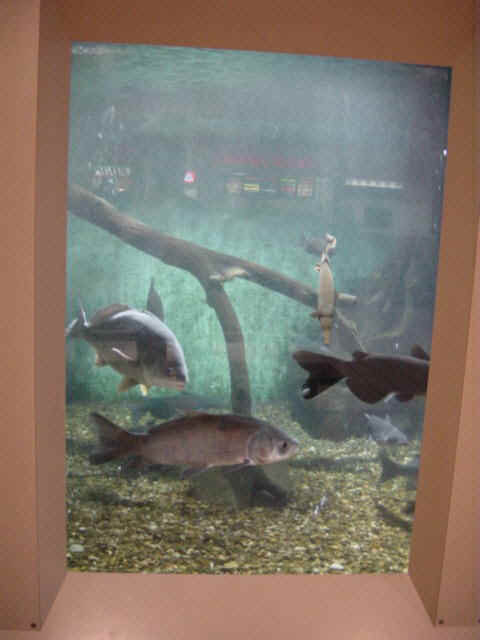 The 15,OOO-gallon aquarium (25 feet long, 12 feet wide, and 6.5 feet deep) recreates a typical Kansas river habitat complete with native fishes, including channel catfish, bluegill, crappie, bass, and walleye. The fish are fed daily at 4 PM. Click the icon to find a birding list for Saline County. Lakewood Park, in northeast Salina, is east of Ohio Street between North Street and Iron Street. The red dot marks the site of the Discovery Center. Indian Rock Park is just two blocks south of the entrance to Lakewood Park on Indiana Street. The Kansas Fishes Exhibit is in the southeast corner of the Central Mall at 2259 South 9th Street. From I-135, take the Magnolia exit and go east to 9th street. The mall is at the northeast corner of that intersection. 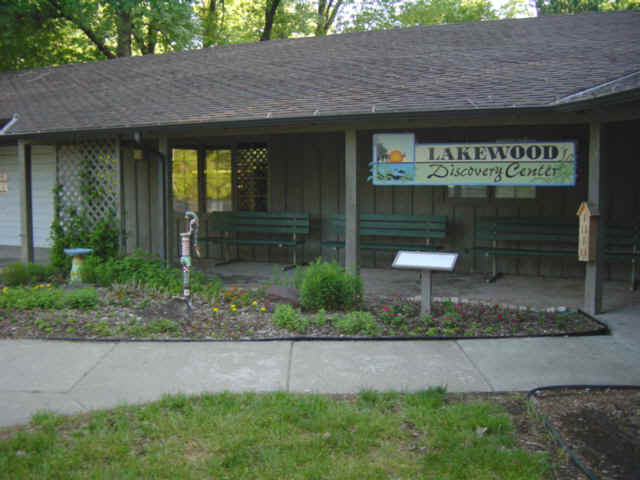 The Google Map for Lakewood Park and Indian Rock Park is here. The Kansas Fishes Exhibit Google Map is here. Ownership: The City of Salina manages Lakewood and Indian Rock Parks. Contact Bill Gaskill or Brian Underwood (785) 826-7335 if you have specific questions about use or management of these sites. Contact the Central Mall Merchants Association at (785) 825-7733 regarding the Kansas Fishes Exhibit. Click here to visit the web site for the mall. Click on the "Aquarium" link to learn more about it.